Along with outside summertime fun comes the hassle of ticks, as well as the discomfort and potential illnesses they can spread. With all of the Lyme Disease and foreboding tick population predictions in the headlines, here are ways you can greatly reduce ticks at home by following the below 5 tips. 1. Cut the Lawn! – By getting rid of all the tall grass and brush at the perimeter of your lawn, you are removing the areas where ticks like to hangout. Also rake your lawn of dead leaves and cut grass so moisture does not collect. 2. Create a border – Ticks do not like to cross over rough terrain such as gravel, sand or wood chips. Place a border between your yard and wooded areas to keep ticks from entering your lawn. Place jungle gyms or other toys for kids away from the border areas. 3. Stack Firewood Neatly in the Sun – Ticks like damp, shaded area to hide. Stack your firewood neatly in the sun where it can continue to dry. Ticks are less likely to hide in dry sunny spots. 4. Repel Ticks with a Plant – Select plants for your yard that are proven to repel ticks such as the American Beauty-berry bush. Not only is it an attractive plant with cluster purple berries but its leaves have been proven to repel ticks. 5. Treat Your Yard to Repel These Blood-Suckers – Use a product such as Thermacell Tick Control Tubes that is a no spray, easy to use way to kill ticks that carry Lyme disease. You can also spray your yard with chemicals by calling a professional who has a high-pressure spray to do this. Or use both tick tubes and spray for long-term and short-term protection from ticks. By keeping these tips in mind, you can reduce ticks in your yard and help protect your family from dangerous diseases. Just one bite from a tick can make you sick, or even change your life, but being proactive at home will reduce your chances of being bitten. 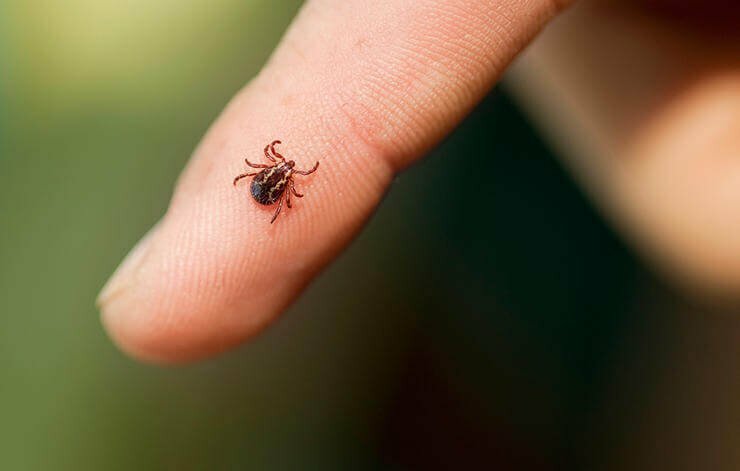 The majority of people who get Lyme are bitten by a tick in the summer in their own yard. Young boys, aged 5-9 are at the highest risk along with adults in their 40s and 50s. These populations spend the most time outdoors, either playing or working around the house or possibly enjoying their deck. Remember ticks don’t jump, fly, or drop from trees onto your head and back. Ticks crawl up over your entire body to try and attach around your head or ears where the skin is thinner and hosts have more trouble grooming.